Forums General Discussion Cartoonish Graphics or Death? 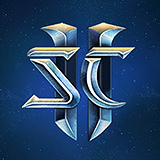 Whom, is satisified with the cartoonish graphics in SC2 and who would rather have a more augmented realistic touch to it? =/ Perhaps this "new" engine has capabilities to modify it to be better =-d? Not to be a pill, but, they wanted the game to be playable by people who DONT have 500 bucks to blow on 2 high quality gpus and the know-how to crossfire them. Plus the kids. It's Blizzard's typical art style. If you don't like their style, then go play something else. I bet the OP's dad whined about how bad the graphics were in pong when he was a kid. Its just Blizzard's style and this trend of all games having to look realistic bothers me. Borderlands, SC2 and TF2 are all cartoonish games and they would be boring otherwise. Go play Warcraft III. It is much more cartoonish than this. This is actually fairly gritty and dark compared with previous titles. My computer can only run the game with the lowest settings, and while installing the game, a message popped up saying my computer couldn't actually handle it. And how does this look to you? The game really doesn't look that cartoon like if you can turn your settings up all the way. The cartoony look comes from the lower rez textures and lower poly count models that let everyone get to play without needing their parents to buy them new systems. When the first few screen shots were posted all those years ago, I was really disappointed with the art style as well. However, the game now doesn't look anything like that if you are at High or higher settings. Blizzard wasn't bought out. I wish people who don't know what they're talking about would stop posting this crap. Did your keyboard break halfway through typing family? You have the right number of letters, but they're all m's. Also, how are these graphics cartoonish? The "cartoonish" graphics are MUUUUCH better than "real" graphics simply because it is easier to see what is going on. See Dawn of War, you can't determine wtf is going on AT ALL with that.